It’s become a tradition on the blog (and in my PETiQuette newspaper column) to share my favorite Christmas cat story this time of the year. This touching legend, included in Complete Kitten Care book, tells the story of a simple Tabby cat, and her gift on the very first Christmas day to a special mother and child. My own special tabby boy honors this page–notice the “M” on Karma’s brow…Enjoy! Please be safe if you’re traveling. May your holidays be blessed. There was no snow that night in Bethlehem. Instead, the small cat watched a star-spangled sky from her perch in the window of a stable. She liked the stable, for it was a warm safe place to raise her furry babies, and the innkeeper sometimes left scraps out for her to nibble. Tabby wasn’t particularly distinctive, and most humans didn’t look at her twice. After all, her short gray/black fur was quite common. But Tabby’s striped coat hid a heart bigger than cats twice her size. This night, though, Tabby was out of sorts, for she’d not been able to hunt and catch dinner. Travelers had poured into town for days, so noisy they disturbed decent cat-folks’ rest. Why, they’d even invaded Tabby‟s quiet stable, a place she had before shared only with other furry creatures. Tabby hadn’t minded the human couple—they were calmer than most. She’d left that morning for her usual rounds, but when she returned, the stable was packed with people. “Meewwww, meewww, meewww,” cried a tiny voice. A kitten? Tabby’s ears turn this way and that to find the sound of the kitten’s voice. It came from the manger, the very place Tabby often made her own bed. A woman knelt beside the manger, intent on the small mewling that arose from within. Tabby was drawn by the kittenish sound, though she knew her own furry babies were grown to cat-hood. She tiptoed forward very slowly, and passed by a wooly burro, a warm cow, and all the other animals. And, as Tabby watched, each stable animal stepped forward in turn and tried to soothe the woman’s baby. But the kittenish sounds continued, and finally Tabby could contain herself no longer. Quickly, she washed herself—paws, face, behind the ears, to the very tip of her tail (so as not to offend the child’s mother)—and then shyly stepped forward. She leaped gracefully to the manger, and stared into the face of the most beautiful baby (human or kitten!) she’d ever seen. He cooed and smiled, waving his tiny hands at Tabby, and she very carefully drew in her claws and settled beside him. Forgotten was her empty tummy; she could only hear her heart calling out to this sweet human-kitten. The wondrous cat-song filled the stable with overwhelming emotion. The animals listened with awe, and the child’s mother smiled as her baby quietly went to sleep. 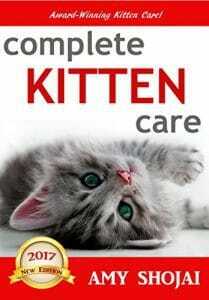 The child’s mother placed her hand gently on the purring Tabby’s forehead. “Blessings upon you, Tabby-cat, for this sweet gift given to me and my child,” she said. And where she’d touched Tabby’s brow, there appeared an M—the sign of the Madonna’s benediction. Such a beautiful, touching story! Merry Christmas, Amy – wishing you a beautiful holiday week with your family, friends, and “best friends”. This story always touches my heart. I think of my beloved tabby cat, Pippen, and know she’s watching over me from above on this Christmas day. Thanks, Amy, I love to be able to share this! Do you have any idea of the origin of this story? I’d love to illustrate it someday. I don’t remember the origins–there are so many legends. *s* You certainly can share this blog post, if you wish, with credit to the book excerpt. Great Christmas story Amy. Have lived around cats most of my life – those on the farm and later on, those who chose me as a caretaker. Stopped by from Susie’s party. the comment about juggling cats caught my eye. Lovely story. Now every time I see a cat with an M on it’s head I will think of this story. Merry Christmas! Lovely story, Amy! Thank you for sharing it. Wishing you all good things in the New Year. You too, Pat, thanks for stopping by! Of course I always lay claim to this story because it is about my birthday buddy 🙂 (just kidding). I first heard it when a judge was looking at my Baryshnikat (a red mackerel tabby) and commenting on the perfect “m” on his forehead. I do hope you had a wonderful Christmas. Oh Amy this warmed my heart. What a beautiful story. I’m so glad I have three Tabby’s – a black/gray/silver and two yellow ones. Hope you and your family had a glorious Christmas. I know Santa came to see Seren and Magic. Awwww. This is such a nice story! Cute little story! I was imagining something different for the M. My name is Emma, but I am often called M or M’s, thought maybe it would be something like that. What a sweet story – thanks for sharing it with us. Thank you! I love some of the fables and stories that help “explain” such things! What an incredibly touching story. Merry Christmas! Thank you Cathy! Merry Christmas! Our new orange tabby girl has an “M” on her forehead! What a wonderful Christmas story. Thank you for sharing! What a neat story! I hadn’t actually ever hear this one. I hope you and all your pets have a wonderful Christmas. I love this story. It’s so sweet! What a sweet story! And what a beautiful “M” it is! What a wonderful story, thanks for the smile! Happy Holidays! How sweet is that?! So nice and heartfelt. Love this! Am I sense a twist on a very well known biblical story here? 🙂 What a beautiful kitty too! 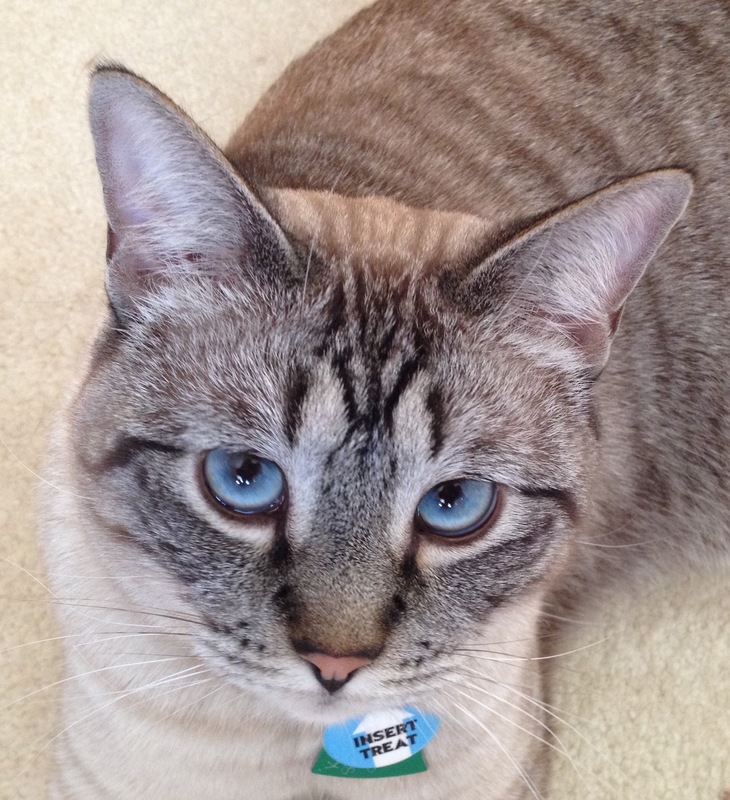 Beautiful story – our late cat Maxwell had a prominent “M” on his brow! What a beautiful and touching Christmas tale! Love it! Always makes me tear up that story. Of course cats are billiant and would do exctly that! what a truly sweet story . What a lovely story- I had never heard that before. I wonder what Pug markings say? Happy Holidays. I absolutely love this! I am going to read this to my daughter Christmas eve. We don’t currently have a Tabby in our household, but we had two when my daughter was a baby. They both passed away in 2009 when my daughter was only 3. This will be a nice way to honor their memory and Christmas at the same time. Such a wonderful story! Gives me a warm feeling inside. That is a beautiful story. I’ve never heard it before! Pingback: Tabby Cat Tuesday - Baptize A Cat? I love this story, tool.